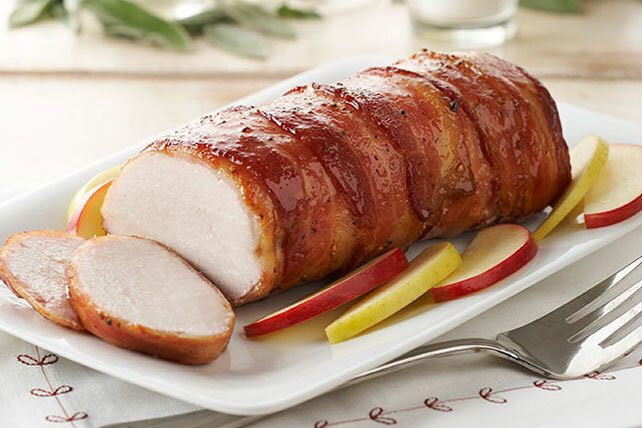 If the bacon-wrapped part of this pork tenderloin dish didn’t already win you over, maybe the glaze of apple juice, brown sugar and Dijon mustard will. Wrap bacon around tenderloin; place in foil-lined pan sprayed with cooking spray. Sprinkle with pepper. Bake 20 min. or until cooked to 135ºF. Meanwhile, bring remaining ingredients to boil in saucepan on medium heat, stirring occasionally. Brush meat with sugar mixture. Bake 10 min. or until tenderloin is done (145ºF). Remove from oven; cover loosely with foil. Let stand 3 min. before slicing. Cook 2 tenderloins. Serve 1 tenderloin. Cool remaining tenderloin. Wrap tightly in plastic wrap, then in heavy-duty foil. Freeze for another use, such as a hearty salad or wrap sandwich.